One of the best things we can do for our health is to eat a rainbow of foods every single day. That doesn’t mean you should grab your box of artificially flavored breakfast cereal and call it a win! When I say ‘eat a rainbow’ I mean a rainbow of all natural foods that God (or Mother Nature or just pure Dumb Luck) created! Brightly colored fruits and vegetables contain an amazing array of nutrients and not just vitamins and minerals. There are antioxidants to fight off things like cancer and Alzheimer’s disease. There is Beta-Carotine which may provide protection to your cardiovascular system. And there are so many other reasons that fruits and vegetables are good for you, but they are way too numerous to list here. So, you KNOW you need to get more brightly colored fruits and vegetables in your diet but if you see ONE more stalk of broccoli you may just toss your plate out the window. I get it, I really do! BUT, you need to learn how to eat more vegetables and not get totally sick of them! 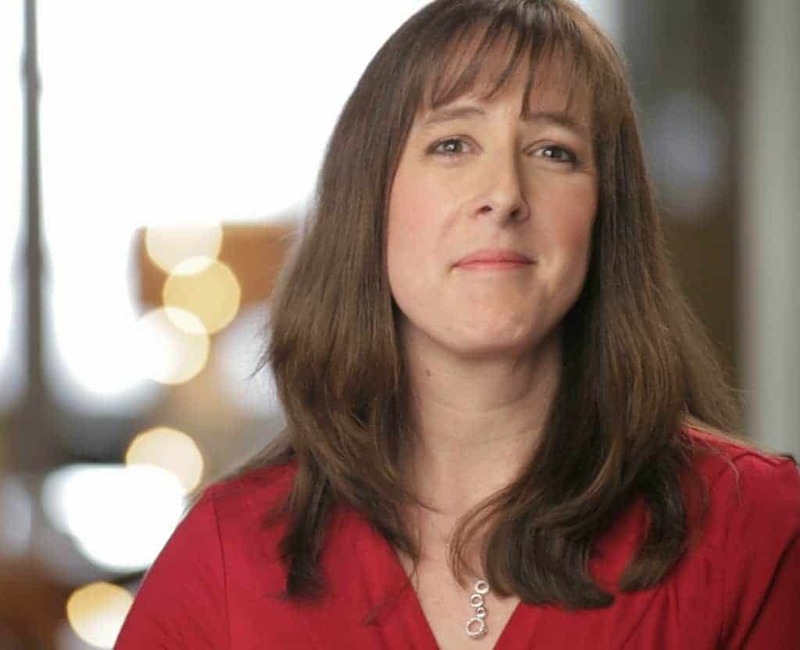 Here are a few simple ways to do it! 1. Bake them into something. I would much rather eat a carrot muffin than a plate of carrot sticks any day. Add pumpkin puree to your pancakes and shredded zucchini to your quick bread. There are a million ways that you can bake your vegetables right into something else. 2. Take your salad beyond iceberg lettuce. Iceberg lettuce really has zero nutritional value! Get crazy with your salads…add baby spinach and arugala. Top it with some roasted beets, blue cheese and walnuts. 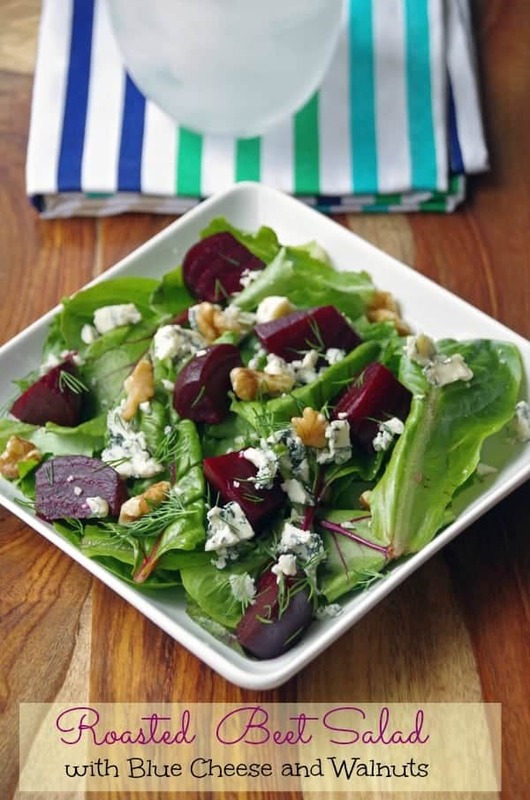 (check out my recipe for Roasted Beet Salad with Blue Cheese and Walnuts!) Add red, yellow and orange bell peppers instead of plain green ones. Try and see how many cool colors you can get into one small salad! 3. Kick them up a notch with a light breading. Okay, you really don’t want to slather your vegetables in batter and deep fry them. That is kind of going against the whole ‘healthy eating’ concept. But, there is no reason you can’t dip them in milk, roll them in breadcrumbs and bake them in the oven to get a tad bit crispy. Once they are done, dip them in some low fat ranch dressing as a replacement for higher fat french fries! 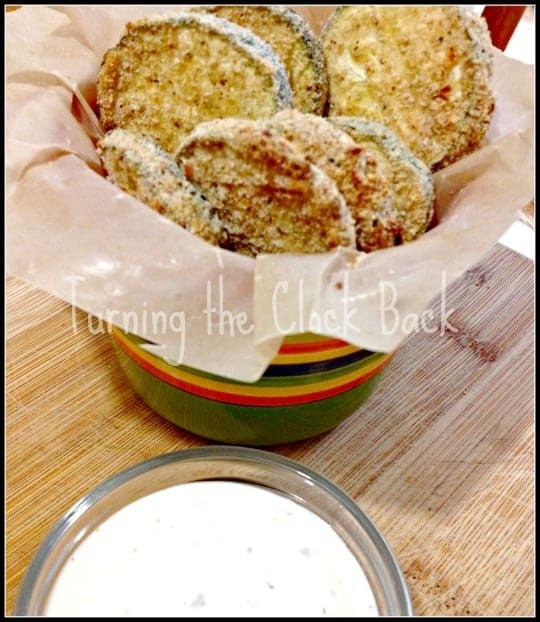 Check out my Zucchini Oven Chips with Parmesan Cheese recipe! 4. Drink them in juice! 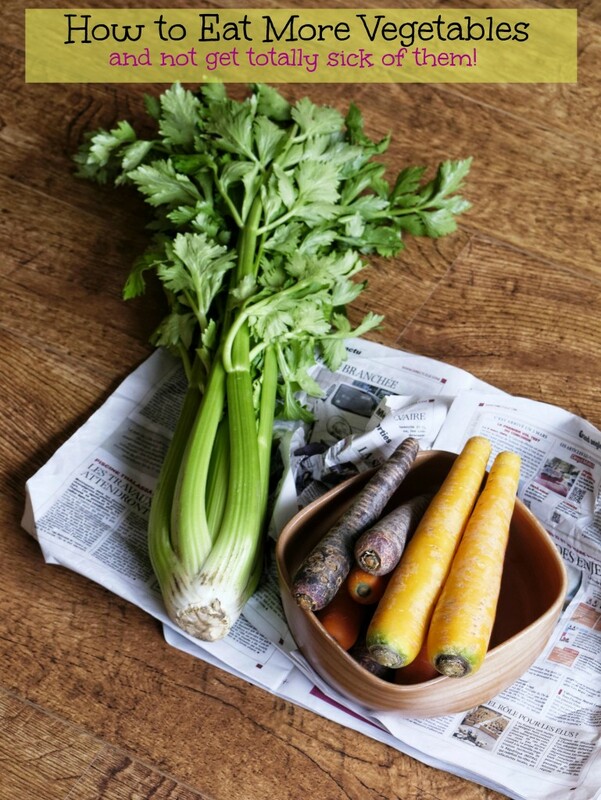 If you want to learn how to eat more vegetables you really need to consider vegetable JUICE! You don’t need to own an expensive juicer to start incorporating vegetable juice into your diet. There are premade varieties in the grocery store like Tropicana Farmstand Tropical Green that are tasty, nutritious and inexpensive! Tropicana Farmstand Tropical Green contains juices from sweet potatoes, grapes, apples, bananas, mangos, pineapple, oranges, carrots, limes, kale and spinach. All of those nutritious ingredients combine for a delicious, tropical taste. 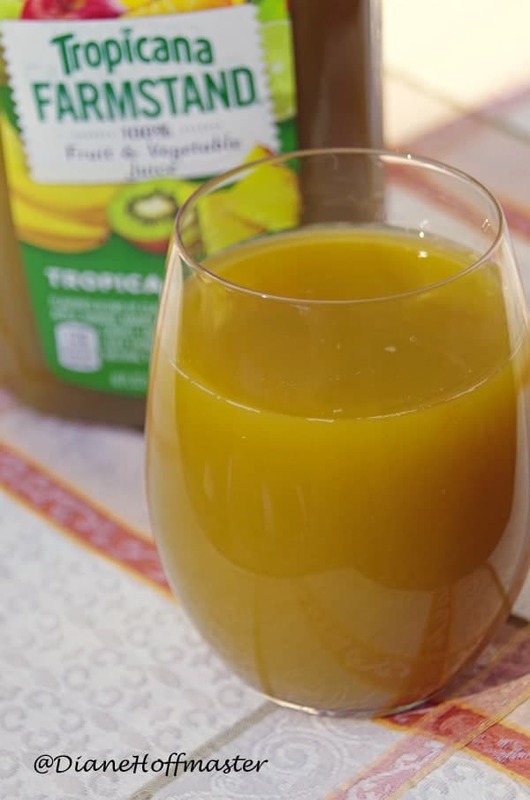 It is an excellent source of vitamins A and C. Farmstand Tropical Green gives you one serving of fruit AND one serving of veggies in every glass. It contains 100% fruit and vegetable juice and has no added sugar. In order to get the number of fruit and vegetable servings we really need, we should be eating them at every meal. Getting fruit at breakfast is easy but learning how to eat more vegetables at breakfast has been challenging! Tropicana Farmstand Tropical Green is an easy and delicious way to get an entire serving of fruit AND vegetables at the very first meal of the day! I found the taste to be absolutely delicious and refreshing. Mostly I noted the pineapple juice with other tropical hints and couldn’t tell there were vegetables in there at all. 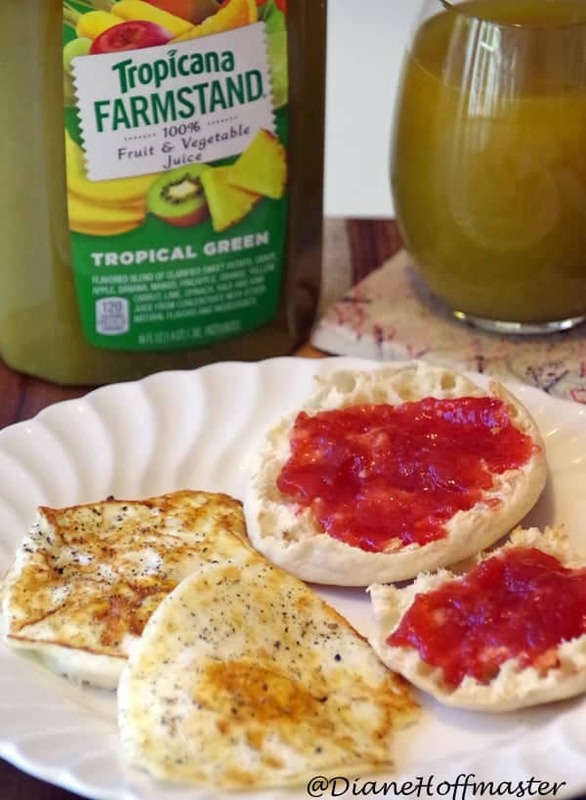 Even if you are just grabbing a quick breakfast to go as you run out the door, Tropicana Farmstand Tropical Green is easy to pour into a travel mug to take with you. At least you know you have one vegetable serving done before you even get to work! Check out the Tropicana Farmstand Tropical Green website for more information about this great new product. While you are there, you can get tons of great information about More Tropicana products as well! 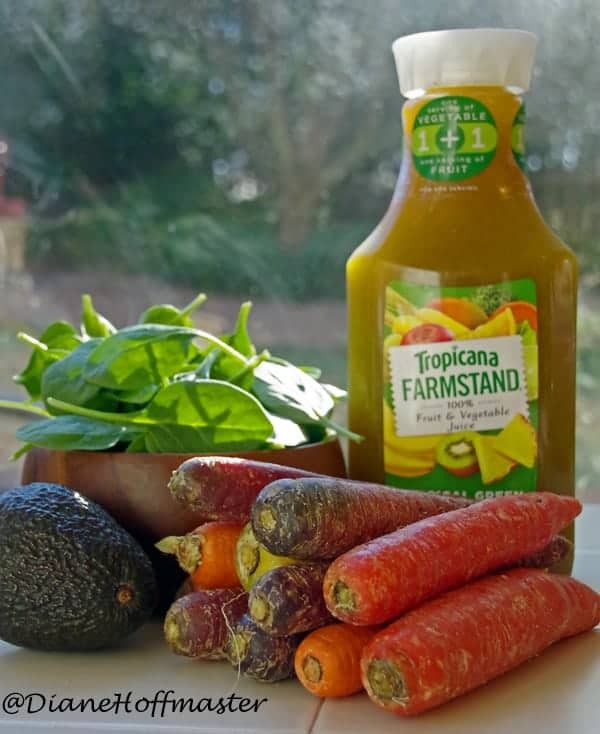 Tropicana would like to provide one of my winners with TEN free product coupons so they can try Tropicana Farmstand Tropical Green Juice for themselves. This is a Giveaway Tools contest so follow the directions in the linky below to enter to win. I would really like to try the tropical green. Yum, kiwi's! I LOVE veg/fruit juice, and it can be a pain to buy, peel, slice, and juice them, and then clean off your machine. A pre-made juice that still gives you the benefits is just the ticket! I love Tropicana 50 orange juice. This fruit & veggie juice sounds really interesting. I'd love to have my family try this, especially my kids who don't eat enough veggies. I like the berry punch twister drinks. My favorite is Pomegranate Blueberry. I enjoy drinking grapefruit juice. My favorite juice is unsweetened cranberry juice. I've always been an orange juice girl. I love any kind of strawberry banana flavored juice. My favorite is pineapple juice. I think it is the best! My favorite juice is mango orange juice. It is so yummy! My favorite is apple juice. Our kids are a little more particular. They like the combination juices. Orange juice with no pulp is my favorite. Pineapple Is My Favorite Juice. I love orange juice and Trop 50 makes a good low calorie. I love the Tropicana OJ with lots of pulp. I haven't tried the Tropicana Farmstand yet. It sounds great! I love orange juice with pulp. We squeeze our own orange juice, we have never tried getting into more vegetable juices. I love Pineapple Orange Juice! My favorite juice is grape juice! Orange juice is my fave, yum! I like my homemade smoothies best, but as far as juice goes I love apple juice. I like fruit punch the best . Thank you! My favorite juice is orange juice. Thank You for the giveaway…love fresh carrot juice with a splash of pineapple juice added ! i really like pineapple juice or white grape juice. I like just about any kind of fruit juice and I used to drink V8 Vegetable Juice! I would be willing to try any new juices! I like Pineapple Orange Juice. (I also like grapefruit, but I'm no longer allowed to drink it, for medical reasons.Booo!)! My favorite is strawberry kiwi juice! I love a good Mixed Berry Juice! I like most any juice (drinking carrot juice right now). I think cranberry would be my favorite type of juice though. Apple juice is my favorite juice. These tips were super helpful. I love vegetables but get burnt out on them really easily so I'm always trying to find ways to sneak them in. In the winter I love to make soups that have at least three veggies in them so that I know I'm at least getting a few servings. Another thing I like to do is I make a simple dip for raw veggies. All it is is sour cream and a package of ranch spices. Probably not the most healthy thing but at least it gets me to get my raw veggies in! I've never thought of breading them though, that's a great idea! I love dipping veggies! I usually do blue cheese dressing which ( I agree) isn't the healthiest choice but it does get me to eat a whole ton of raw broccoli!